Find 'modelpanels_kv' and then the section 'itemmodelpanel' where you add: "inventory_image_type" "1"
I'm looking at the images and backpack in original size, for me the item images look so much better after adding this line. 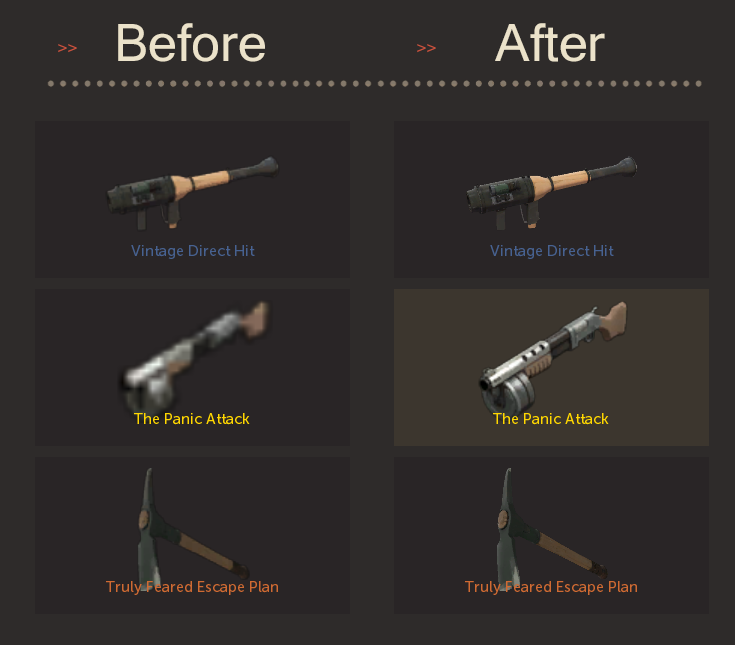 Here's a side-by-side cutout of the Vaccinator in the item selection screen, I hope these show the differences. Cool find, I'll put that into my HUD edit. A major difference starts to appear when you use performance configs. In this example, I have used m0rehighfps config for comparison. Really nice find! Actually a very nice find, thank you! Especially that The Panic Attack doesnt look like a blur anymore! Nice find. I put it in resource/ui/classloadoutpanel.res, but there is no change. The others work perfectly. Any idea? I didn't even realize I wanted this until I saw this thread. Now I love it. Does this affect the overall performance in any way? I can confirm that it also works for inspect panel icons (F button when you aim at player). It is under itempanel > itemmodelpanel of HudInspectPanel.res and Spectator.res. georgeDoes this affect the overall performance in any way? I was wondering when someone would find out how to do this. Thanks man. Still works in classloadoutpanel. Broken in itemselectionpanel. Only when these high-quality images are on your screen. It won't affect ingame performance in any way, just backpack and loadout pages. This will pretty much destroy your performance if you set it for the backpack page. 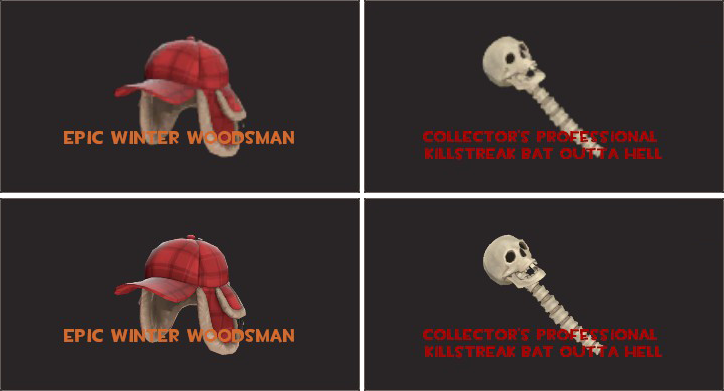 Reason for this is because when you have the high quality item type selected, every frame the game will reload the vmt for each image shown (presumably because valve didn't think there would be many of them on the screen at the same time. Because of this the overhead from the filesystem will pretty much crush your frames if you don't use it sparingly. You can slightly improve your performance (~5% for me) when using this trick by setting filesystem_native to 0. Working fine in itemselectionpanel now. Is there any way to make this work in itemquickswitch? yttriumIs there any way to make this work in itemquickswitch?